Join us and help to spread the word as we walk the Thames Path all the way to Parliament to demand our MPs end the drug war. When my son died in May 2016, alone on the other side of the world, trying to manage his opiate dependence, I felt like I died too. I wanted to walk to the edge of the world and beyond, but our planet has no edges. And so I walked and talked and met many people who have similar stories and it became clear that most of these deaths could have been avoided. A robust review and reform of drug policies may prevent more families knowing the despair of losing a loved one in this way. Let’s turn walking into action. Please join us and “Walk a Mile in Our Shoes”. Tell us how current drug policy has impacted you and hear our stories. 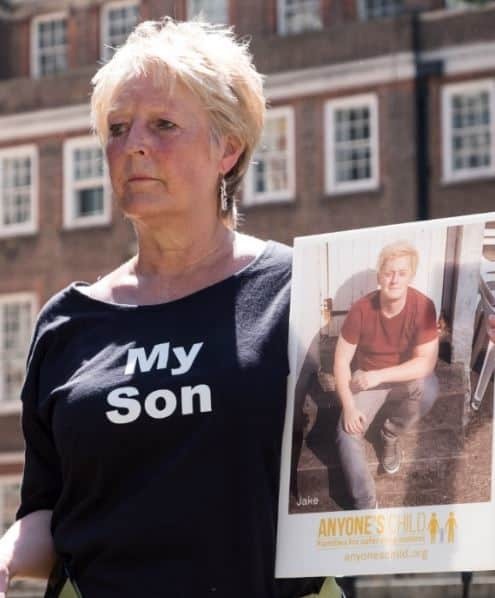 I am walking for my son Jake; so his existence is not meaningless, so that 22 years of loving is not wasted, so that minds can be changed and attitudes altered. Jake’s motto was “Think Free” – please join us for an hour or a day and learn how changing the law could improve life for all of us in the future. Join the walk – Please join our walk along the Thames Path and help us to raise awareness about the harms of current drug policy and make change a reality. You can set up your own JustGiving page here. Meet your MP – Don’t worry if you cannot make the walk. Contact your MP and join the mass lobby on Tuesday 25th June. More info here. Do email info@anyoneschild.org if you would like to join. Please join for as much or as little as you like. There are trains or underground stations all along the route, so anyone can finish early and catch up by public transport. Exact details will be confirmed nearer the time. Leaving Staines and heading through Shepperton to Hampton Court, where we can visit the maze. On the final day everyone attending to mass lobby will meet at Battersea Park and walk on to Westminster Palace en masse. This is where the walk officially ends with a gathering outside Parliament. Please join us on this walk to help end the drug war, better protect our children and get drugs under control.